This Obstacle can hold one Soldier. A Soldier in this Obstacle has cover and gets +1 on cover rolls. Q: Can a Soldier Artillery unit like the German 88 Flak Gun with the Large SA be placed inside a Pillbox? Q: Can units like Ammo Dumps, Fuel Depots and Headquarters be put inside a Pillbox during deployment? 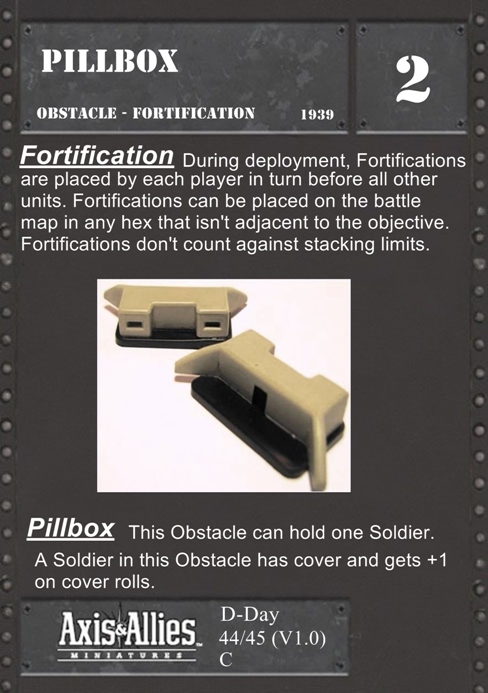 Q: I can't find the rules covering obstacles or fortifications like Pillbox. Where are they? What do they say?